This picture of the Gould-Shaw House was taken in 1900. 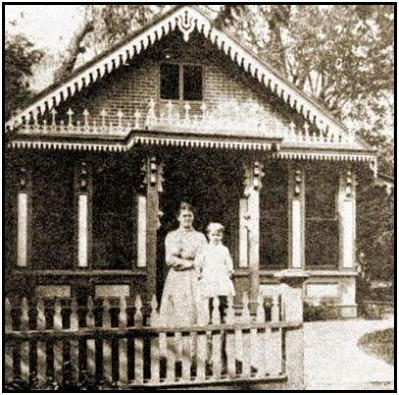 Members of the Shaw family can be seen on the front porch. The large side yard on the right is the current location of the Cloverdale History Center and gardens. 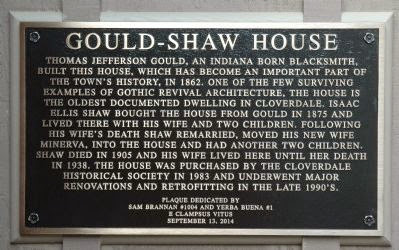 When Indiana-born blacksmith Thomas Jefferson Gould built his home on Cloverdale’s West Street in 1862, he had no way of knowing it would one day be known as the Gould-Shaw House, much less that it would become such a significant part of the town’s history. 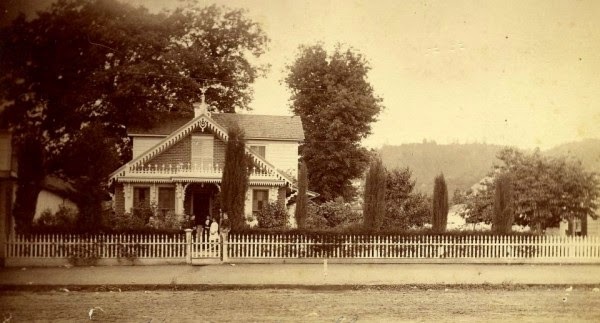 Located at 215 N. Cloverdale Boulevard, the house is the oldest documented dwelling in Cloverdale and one of the rare surviving examples of Gothic Revival architecture. This is an architectural style of the Victorian era that is characterized by steeply pitched roofs, pointed-arch windows, elaborate trim along roof edges, and high dormers. Isaac Ellis Shaw bought the house from Gould in 1875. He lived there with his wife Louisa and their two children, Charles and Ella, until Louisa’s untimely death in 1878. Shaw remarried the following year and moved his new wife, Minerva, into the house. They eventually had two children of their own, Frank and Gertrude. Shaw died in 1905 and Minerva continued to live there until her death in 1938. The year his first wife died, Shaw had formed a business partnership with John Bowman. They built a large brick building on the NW corner of West Street at Second Street where they operated a mercantile store known as the Shaw Bowman Company. The building changed hands several times over the years, with the last owners being Ray and Bernice Donnelly, who operated the Donnelly Department Store until 1971. The building was razed in 1975 to make room for a parking lot, which is what it still is today. In the early 1880’s, banking activities were conducted out of the Shaw Bowman Building. A bank charter was officially obtained by Shaw and six other merchants on February 25, 1884. First called the Cloverdale Exchange Bank and later the Bank of Cloverdale, Shaw was the first president. After Minerva’s death, the house had several owners before the Cloverdale Historical Society purchased it in 1983 with the idea of turning it into the Cloverdale Museum. The structure was added to the National Register of Historic Places in 1992 and underwent a major renovation and retrofitting in the late 1990’s. This Saturday, July 21, the public is invited to come by from 3 to 5 p.m. and celebrate the 150th birthday of the Gould-Shaw House with an old fashioned ice cream social on the garden patio. In addition to ice cream, there will also be birthday cake and balloons. Tours of the both the Gould-Shaw House and the new History Center will be available. 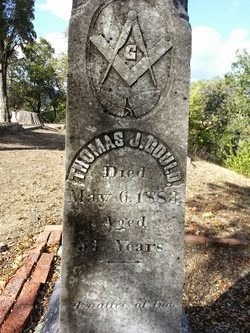 Thomas J. Gould. Born in Dearborn County, Indiana, June 2, 1830, where he resided on a farm until seventeen years of age, when he commenced an apprenticeship to the blacksmith trade, which he followed until 1852, when he crossed the plains to California with ox teams. On arriving at Webber creek, August 14th of the above year, he engaged at once in his previous vocation, in the mines, which he followed until 1857, when he moved to Cloverdale, Sonoma county, where he followed his trade until 1866, when he returned to the East, and after an absence of about six months, again returned to California. He then, in company with W. T. Brush and D. W. Walker, came to Mendocino county and built a steam saw mill on Dry creek. After spending about six months in this enterprise, the subject of this sketch sold his interests to his partners and returned to Cloverdale, where he built a livery stable, which, as soon as finished, he traded for his present property, consisting of six hundred and forty acres, located in Sanel township, on Dry creek, where he now resides, and is engaged in stock raising and wool growing. He married, April 4, 1855, Miss Martha J. Comer, a native of Ohio. Mount Davidson, on the far western reaches of Nevada, looms above a miner at the lower dump of the Gould & Curry Mine in 1865. Although the Comstock Lode entered into decline that year, its fortunes would revive in the early 1870s, when the Silver Kings struck the "Big Bonanza," the massive veins of silver and gold buried deep beneath the windswept heights of Mount Davidson. 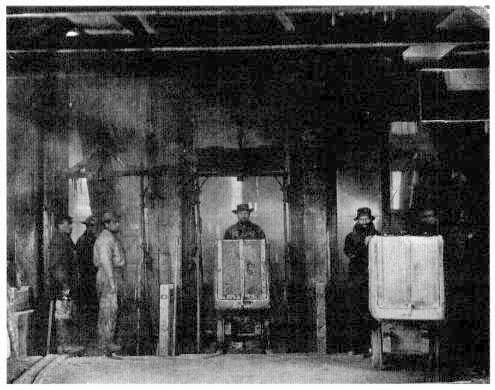 Financed in large by California capital, the mines not only produced enormous quantities of high-grade ore but sparked volatile trading in silver stocks on the San Francisco exchanges. 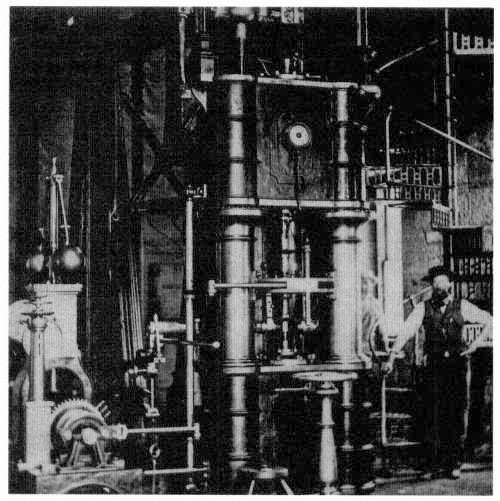 Courtesy Huntington Library, San Marino, Calif .
A workman poses with one of the massive steam engines at the mill of the Gould & Curry Mine, Virginia City. 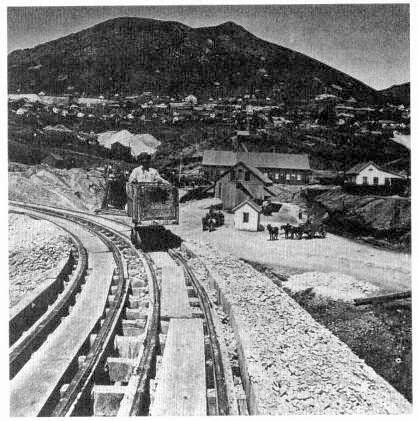 On the Comstock Lode, powerful engines manufactured in San Francisco drove a range of hardrock mining machinery, including pumps, compressors, hoists, and stamp mills. Courtesy Huntington Library, San Marino, Calif .